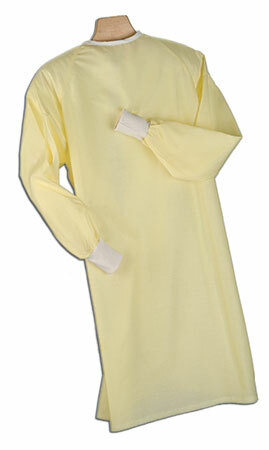 YELLOW ISO GOWN: Full front and back protection on a sturdy 50/50 blend. We offer full girth sizing and reinforced back-ties. The stockinette wrist cuffs are comfortable, yet protective. PRECAUTIONARY GOWN: A Fluid resistant barrier fabric gives optimum protection in white single-ply fabric. This backless design adds comfort and two back-ties at the neck and waist with white stockinette wrist cuffs.